R&B legend Wilko Johnson announces new tour for 2017! 2017 – A dual celebration – The Wilko Johnson Band 30th Anniversary & Wilko Johnson’s 70th Birthday. ‘I’m supposed to be dead!’. So said Wilko in a recent interview, having been diagnosed in late 2012 with terminal pancreatic cancer. But despite the doctors’ worst predictions he continued to perform and present himself with vigour and a new zest for life. In 2013, Wilko announced that, thanks to a second opinion and subsequent life-saving surgery, he was cancer-free. The man from Canvey Island, who studied English at Newcastle University before doing a bit of travelling, could have been a retired teacher by now, sucking on a pipe and whittling away at his pension. But no, Wilko was lured into music by the dark magic spun by his first Telecaster, bought from a music store in Southend, Essex, soon after becoming the strutting, grimacing, six-string rhythmic powerhouse behind Lee Brilleaux in Dr Feelgood. 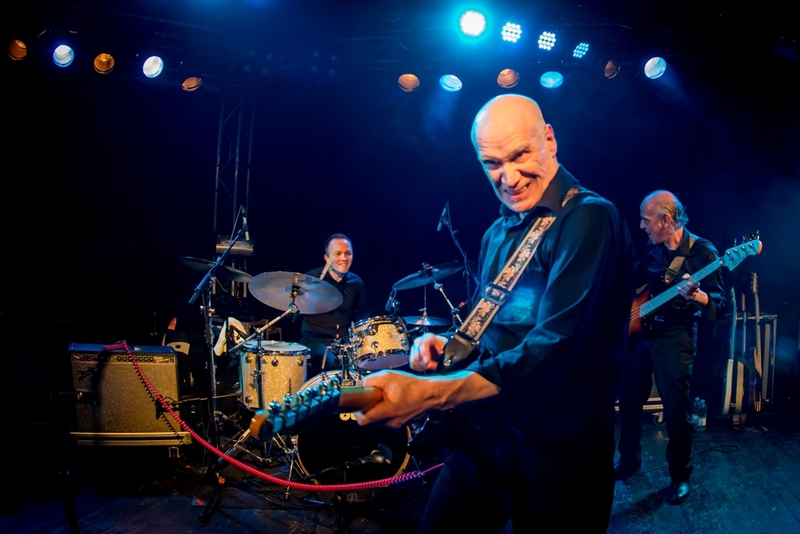 Throughout the mid-70s, Wilko duck-walked his way across countless stages and venues in the UK with Dr Feelgood in the vanguard of the pub rock movement, performing the gutsy down-to-earth rock and roll that was a welcome antidote to prog-rock. Heavily influenced by legendary guitarist Mick Green from ’60s rockers Johnny Kidd & The Pirates, Wilko employs a finger-style, chop-chord strumming action (the ‘stab’, as he describes it). This allows for chords and lead to be played at the same time, giving a fluency and a distinctive sound very unlike the cleaner swat of a pick. With this economic sound, coupled with that black-suited, scowling look, and the yards he covered across the stage pausing only to twist the guitar lead out from under his feet, Wilko became one of the guitar heroes of the era. His influence was felt in bands up and down the country, and later in the emergent punk revolution (Joe Strummer of the Clash bought a Tele after seeing Wilko play). Feelgood had four successful albums in Wilko’s time, then followed a busy creative period playing in an early incarnation of the Wilko Johnson Band, the Solid Senders, before he joined Ian Dury’s band The Blockheads, in 1980. All through the ’80s, ’90s and into the new millennium he continued to gig in the UK, Europe and Japan. But it was when Julien Temple’s award winning Oil City Confidential came out in 2009, with Wilko emerging as the film’s star, that the world once again sat up and paid attention to his extraordinary talent. His career took another twist in 2010, when he was offered an acting part in the hit series Game of Thrones, playing the role of mute executioner Ilyn Payne. He appeared in 4 episodes shown in 2011 and 2012. In the same year, Wilko and biographer Zoë Howe released the book ‘Wilko Johnson: Looking Back At Me’, a coffee-table book of Wilko’s favourite memories and images. The book was published by Cadiz. 2014 saw the release of the hit album ‘Going Back Home’, Wilko Johnson’s collaboration with Roger Daltrey which went to Number 3 in the UK album charts. The pair decided to work on the album together not just because they were both huge fans of Johnny Kidd and the Pirates, but because, as Wilko was still believed to be dying from cancer, it was believed that they’d ‘better get on with it’. Also on the album are Norman Watt-Roy and Dylan Howe, both members of the Wilko Johnson band, Steve ‘West’ Weston and Mick Talbot (Style Council). It was produced by Dave Eringa. In 2015, Wilko and Julien Temple teamed up again for the documentary The Ecstasy Of Wilko Johnson, a film which explored Wilko’s diagnosis of terminal cancer, and the unexpected reprieve that followed. The film would become quite the hit, captivating audiences whether they saw it on the big screen or on BBC 4, and earning a ‘Kermode’ award in 2016. Wilko’s new memoir, ‘Don’t You Leave Me Here’, was published in Spring 2016 via Little, Brown.